Sloanbook: Inspiration to the Work Setting. Love. Kevin & I LOVE Office. Kevin was watching a few episodes over the weekend. I was in the bedroom. Kevin was in the living room. That is as far as we can be from each other while being in our apartment. Not trying to say we were avoiding each other. But this distance is how far Kevin's laugh traveled. More than a few times. The Office is hilarious. And props to my dad who shows it to his employees during meetings. www.zhats.com . 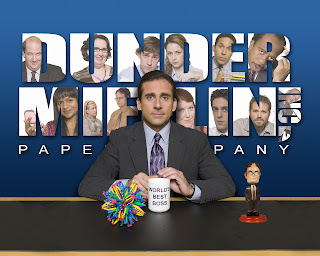 Anywho, Michael Scott wants his work to be like 'family'. 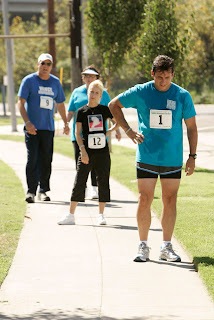 And here he is putting on a very very small 5K or prob less, that he calls "Michael Scott's Dunder Mifflin Scranton Meredith Palmer Memorial Celebrity Rabies Awareness Pro-Am Fun Run Race For the Cure." How cool is that? Any who that is one of my favorite episodes, so just had to throw it in there. The Office is great. We love it. It adds joy to our Thursdays and is a good way to bring in the Friday and weekend! If you do not watch The Office...you should. The end! That's what she said. I think I'd love the Office. I've got to try it out. You can watch it online right?